The election of Abraham Lincoln to the United States presidency is the spark that ignited the Civil War in April of 1861. Lincoln was the first Republican to become President, a feat made even more impressive considering the party had only been in existence for a decade. He was the first President to be born outside of the original thirteen colonies. His birth place was in Hardin County, Kentucky before his family moved to Illinois. 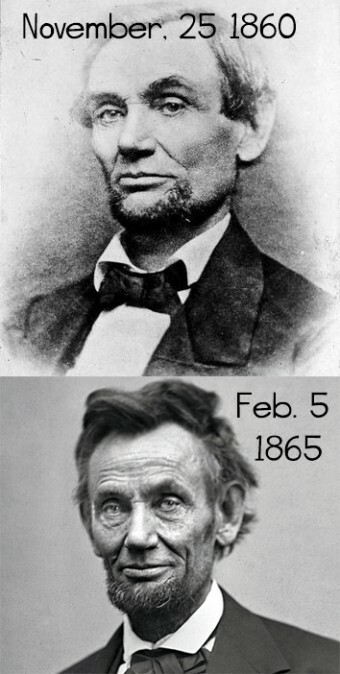 Besides this, he was also the first President to have facial hair, setting a trend. After Lincoln, every elected President except William McKinley would sport facial hair. This streak finally ended when Woodrow Wilson took office in 1913. From then on, U.S. Presidents have remained clean shaven. The rise of the Republican Party was no doubt aided by the divisiveness fracturing the Democrats, who couldn’t even agree on a candidate to nominate for the presidency. Different factions of the party chose their own candidates – Democrats from the Deep South chose John C. Breckinridge from Kentucky, while border-state and northern Democrats nominated Stephen A. Douglas. The Constitutional Union Party, made up of former Whigs and other various factions, chose Tennessean John Bell as their candidate. The 1860 election saw the United States on the brink of monumental change. If Lincoln – a Republican – won the election, it would bring to an end the political dominance the South held over the country for much of its history with Southerners having occupied the White House for almost 70 percent of the time since 1789, and not a single Northern President had ever been elected to a second term up to this point. Tellingly, Lincoln lost all of the slave states but carried all of the free states. When Lincoln’s victory was announced, the southern states wasted no time seceding from the Union, an action they had been threatening for months if a Republican became President. All of this must have led to some uncomfortable moments for President Lincoln’s wife, Mary Todd, a southern-bred lady who had four brothers fighting for the Confederacy. As you might have guessed from this, she wasn’t trusted in Washington by some, and was even accused of being a Confederate spy. Lincoln is, of course, revered for the Emancipation Proclamation, but in reality he didn’t even consider himself an abolitionist, at least not in the beginning of his Presidency. Lincoln voiced his moral distaste for the practice of slavery both publicly and privately, but his political stance was to discourage the expansion of slavery in new territories, rather than purging existing slavery. He didn’t call for the immediate end to all slavery until the 13th Amendment became part of his re-election campaign in 1864. The stress of being President during the Civil War aged him terribly in four short years. Abe wasn’t a looker to begin with, and by the end of his first term in office the toll of being commander-in-chief during the country’s most turbulent times was clearly marked on the man’s extremely ravaged face. Not only was his physical appearance drastically altered, but the haunted, tired look in Lincoln’s eyes is unmistakable. One of Abraham Lincoln’s favorite books as young boy was a biography of President George Washington. You have to wonder what that young lad would have thought if he had known that one day he’d be Washington’s only serious contender for the most loved President in the history of the United States, especially given that in Lincoln’s lifetime, he was arguably the most controversial.